Selecting the right vitamin D supplement is very important. The supplement you buy should be high quality and potent. Ideally it should contain the most “bio-available” form of the vitamin you are trying to take. It should NOT contain other vitamins unless they increase absorption of the primary vitamin AND it doesn’t cause too much overlap with other multivitamins you may be taking. The dosage should be high enough such that only 1 or 2 tablets is required per day to get the correct amount. For now, the highest quality brand I have found and that I personally take is the Nutrilite® brand vitamin D3 plus K2. It contains 2000 IU of vitamin D3 in a single tablet which allows a person to take one or more tablets to get just the right dose per day. 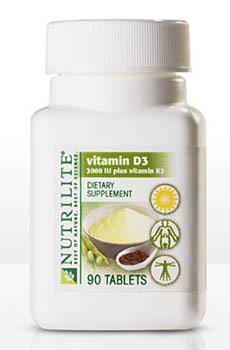 Nutrilite® is certified organic and their vitamin D3 is also Kosher certified. You can buy Nutrilite® Vitamin D3 Plus K2 online at www.actvhealth.com for $29.95 per bottle. The only drawback to this vitamin D3 (or any vitamin D3 for that matter) is that it is not suitable for by vegetarians or vegans. I can’t stress enough how important it is to get the highest possible quality from a name brand. While overdose is rare, when it does happen it is usually because the supplement manufacturer made an error and didn’t have sufficient quality controls. I am looking for other high quality name brands to put here that would be desirable for vegetarians, vegans and children (chewable). Please use the contact form to e-mail me if you have any vitamin d supplement suggestions. Nutrilite® is a registered trademake of Access Business Group.